It is God-awful, lips sticking to your teeth, when you simply smile, and no matter how many layers of clothing applied it is still bone chilling—->Kids from all over Western Pa. learn a day early that school is not in service because of the temps—->Screams of excitement fill Pittsburgh from street-to-street and discussions begin about what else will be closed due to the below-zero wind chill.—-> Everything starts closing: scheduled after school activities, township meetings, church and charity activities, Meals on Wheels, dance classes, pet classes, exercise classes…get the point? Cancellations start spewing like an old radio jock in a shlocky competition. Stop. Breathe. Relax for crying out loud. Yes, it is cold and if being outside can be avoided—avoid it. But it begs the question…what about the mail carrier? Do we need the mail delivered that badly? Can we go one day without the mail, after all can we open doors and step outside to lift the mailbox lid and retrieve the mail? Hmmmmm? Is that allowed? #CutTheCarriersLoose for goodness sake. ONE. DAY! Nothing is being delivered that holds so much clout that a day will make a difference. Come on, we have phones, email, skype, social media, shall I go on? Forego the grocery store circulars, and even the new pizza shop coupons. Release the carriers from their door-to-door duties, from the long walks outside, and for God’s sake do we discuss the little vehicles with no doors to trap some heat? 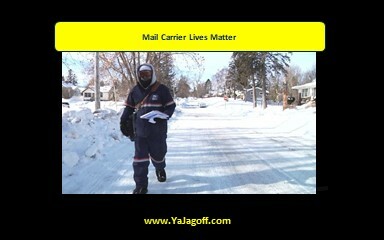 Have a heart for the mail carrier, don’t be a ‘need my mail today or I will not breathe jagoff,’ ya jagoff! Next articleThe YaJagoff “Couple” of Laughs Valentine Game Show! – You Need to Come!